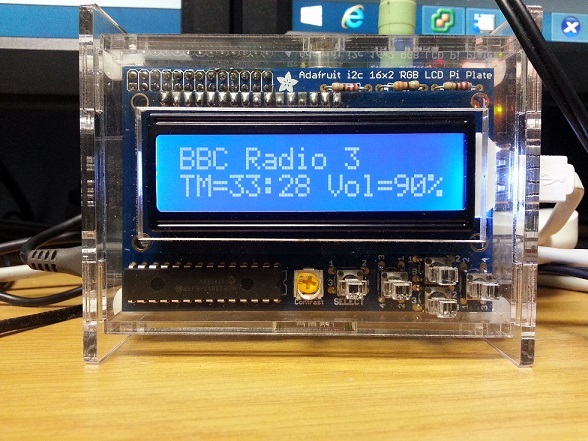 Raspberry Pi: Volumio, a new Music Player (and it works out-the-box!). “volumio” is the migration of the “RaspyFi” project, as a matter of fact, when you go to the “RaspyFi” web-page, a pop-up comes up to inform you of “volumio”. Standard Download and extract to an IMG file and burn with “Win32 Disk Imager”. DHCP on eth0 is the standard. ssh is enabled by default. I then (with “raspi-config”) Change my Keyboard and Location to suit my environment. The elapsed song time, total song time and percentage of song played on line 2. One of the things I have noticed, if you get to the last item of your playlist and hit the “Skip Forward” button, the radio stops. All you have to do is hit the “Select” button and it will start again with the very first item in the playlist. NOTE: Major changes in LCD code. Now in a downloadable ZIP file with a SERVICES option to stop/start. Nice one to get you up and running on the internet with Radio streaming. All you have to do is put the script in your /home/pi directory and run it. Can i install volumio only and not the image. I have not tried yet as I am looking for an all-in-one solution, which volumio is. I would suggest you speak to the developers. Nice! I plan on getting a piface in the near future so this is just the ticket. Came here from the Volumio forum by the way. For the other commenters there’s a tutorial on my site for installing Volumio on piano Linux. No reason why it shouldn’t work on all distros either! For the other commenters there’s a tutorial on my site http://typingoutloud.org for installing Volumio on pibang Linux. No reason why it shouldn’t work on all distros either! Hi, could you recommend where to buy Rasberry Pi from online in South Africa? I am in Cape Town. Thanks for that excellent idea, it’s exactly what I was looking for! Maybe could you help me by adding some informations in your tutorial? You already have in volumio some network shares, one of them is a folder where the radio stations reside, you can drag & drop the radio stations there. Then from Volumio just refresh the folder. very nice tutorial. I do have a question : I am running a headless volumio (1.1 beta) with Hifiberry on top of it . It is working great! I wanted to put an adafruit display (as you did) but I read somewhere that when loading the PiFace software, some libraries are overwritten and the hifiberry does not function anymore … any experience with this combination ? The HifiBerry is a great little DA converter and it really makes a difference in sound quality ! whats on the display when volumino is used as airplay receiver? I had to convert it with the dos2unix tool to get it working. Now it works very well. How does volumio knows to play web radio? Can this be used to play songs on a NAS? Hi Aubrey. Tried following your guide with Volumio 1.5 but the python-rpi.GPIO bit fails. I’ve tried adding additional repos but to no avail. Any hints gratefully received. I am using Volumio 1.5 with Digiberry and your lcdSongInfo.py script instructing a 20×4 Adafruit RGB LCD. It is working very well! I have one favour to ask. When there is no song playing, the display defaults to the bottom line of the LCD showing the inactive timer ” –:– [ –:– “. I am no coder, so I would be REALLY grateful if you could provide me with a version of the script that will display four text lines (of my choice) when Volumio is not playing a song. I hope this request is an easy one for you! Kind regards, Kevin.